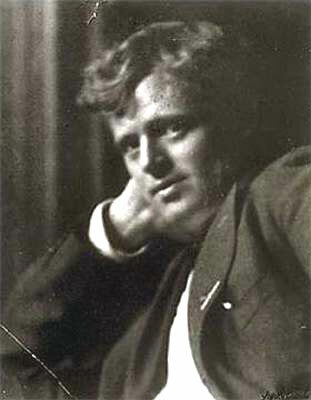 John Griffith "Jack" London (born John Griffith Chaney, January 12, 1876 – November 22, 1916) was an American author, journalist, and social activist. He was a pioneer in the then-burgeoning world of commercial magazine fiction and was one of the first fiction writers to obtain worldwide celebrity and a large fortune from his fiction alone. He is best remembered as the author of Call of the Wild and White Fang, both set in the Klondike Gold Rush, as well as the short stories "To Build a Fire", "An Odyssey of the North", and "Love of Life". He also wrote of the South Pacific in such stories as "The Pearls of Parlay" and "The Heathen", and of the San Francisco Bay area in The Sea Wolf. London was a passionate advocate of unionization, socialism, and the rights of workers and wrote several powerful works dealing with these topics such as his dystopian novel, The Iron Heel and his non-fiction exposé, The People of the Abyss. But it is not particularly easy for one to climb up out of the working-class — especially if he is handicapped by the possession of ideals and illusions. I lived on a ranch in California, and I was hard put to find the ladder whereby to climb. I early inquired the rate of interest on invested money, and worried my child's brain into an understanding of the virtues and excellencies of that remarkable invention of man, compound interest. Further, I ascertained the current rates of wages for workers of all ages, and the cost of living. From all this data I concluded that if I began immediately and worked and saved until I was fifty years of age, I could then stop working and enter into participation in a fair portion of the delights and goodnesses that would then be open to me higher up in society. Of course, I resolutely determined not to marry, while I quite forgot to consider at all that great rock of disaster in the working-class world — sickness. Here I found, also, warm faith in the human, glowing idealism, sweetnesses of unselfishness, renunciation, and martyrdom — all the splendid, stinging things of the spirit. Here life was clean, noble, and alive. Here life rehabilitated itself, became wonderful and glorious; and I was glad to be alive. I was in touch with great souls who exalted flesh and spirit over dollars and cents, and to whom the thin wail of the starved slum child meant more than all the pomp and circumstance of commercial expansion and world empire. All about me were nobleness of purpose and heroism of effort, and my days and nights were sunshine and starshine, all fire and dew, with before my eyes, ever burning and blazing, the Holy Grail, Christ's own Grail, the warm human, long-suffering and maltreated, but to be rescued and saved at the last. As a brain merchant I was a success. Society opened its portals to me. I entered right in on the parlor floor, and my disillusionment proceeded rapidly. I sat down to dinner with the masters of society, and with the wives and daughters of the masters of society. The women were gowned beautifully, I admit; but to my naive surprise I discovered that they were of the same clay as all the rest of the women I had known down below in the cellar. "The colonel's lady and Judy O'Grady were sisters under their skins" — and gowns. It was not this, however, so much as their materialism, that shocked me. It is true, these beautifully gowned, beautiful women prattled sweet little ideals and dear little moralities; but in spite of their prattle the dominant key of the life they lived was materialistic. And they were so sentimentally selfish! They assisted in all kinds of sweet little charities, and informed one of the fact, while all the time the food they ate and the beautiful clothes they wore were bought out of dividends stained with the blood of child labor, and sweated labor, and of prostitution itself. When I mentioned such facts, expecting in my innocence that these sisters of Judy O'Grady would at once strip off their blood-dyed silks and jewels, they became excited and angry, and read me preachments about the lack of thrift, the drink, and the innate depravity that caused all the misery in society's cellar. When I mentioned that I couldn't quite see that it was the lack of thrift, the intemperance, and the depravity of a half-starved child of six that made it work twelve hours every night in a Southern cotton mill, these sisters of Judy O'Grady attacked my private life and called me an "agitator" — as though that, forsooth, settled the argument. Nor did I fare better with the masters themselves. I had expected to find men who were clean, noble, and alive, whose ideals were clean, noble, and alive. I went about amongst the men who sat in the high places — the preachers, the politicians, the business men, the professors, and the editors. I ate meat with them, drank wine with them, automobiled with them, and studied them. It is true, I found many that were clean and noble; but with rare exceptions, they were not alive. I do verily believe I could count the exceptions on the fingers of my two hands. Where they were not alive with rottenness, quick with unclean life, they were merely the unburied dead — clean and noble, like well-preserved mummies, but not alive. In this connection I may especially mention the professors I met, the men who live up to that decadent university ideal, "the passionless pursuit of passionless intelligence."